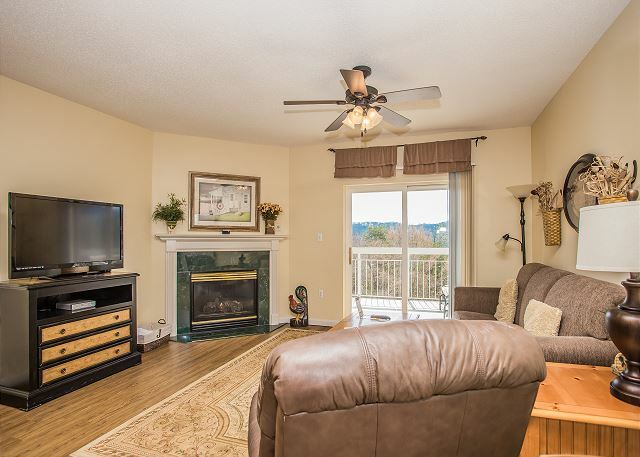 Whispering Pines Condo Unit 441 is your Mountain Home! 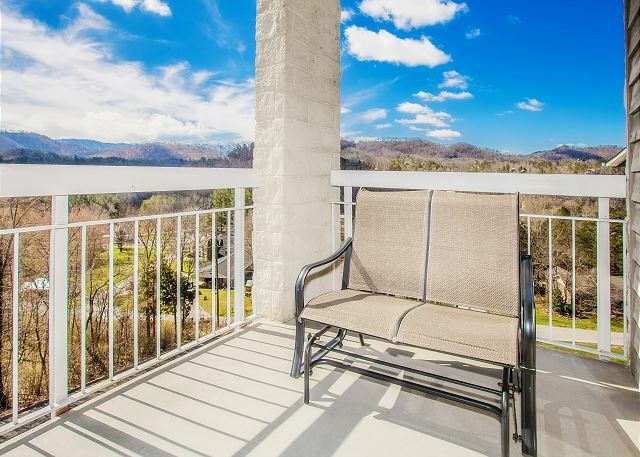 Wait until you park yourself on your private balcony with a cool beverage and gaze at the Great Smoky Mountain view! 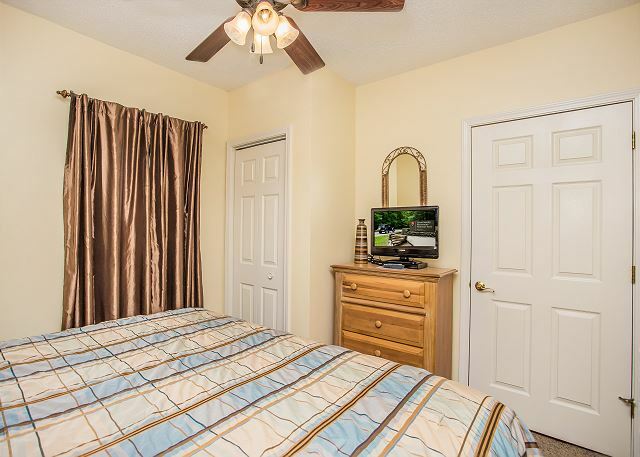 Once you head back inside, a fabulous condo awaits you: plush leather furniture, Jacuzzi tub, king bed, free Wi-Fi, flat screen TV’s, and a full kitchen for those wonderful vacation meals together and midnight snacks! Thank you so much for vacationing with us at Whispering Pines! We're happy to hear that you had a great time and enjoyed your stay in mountain view condo 441. 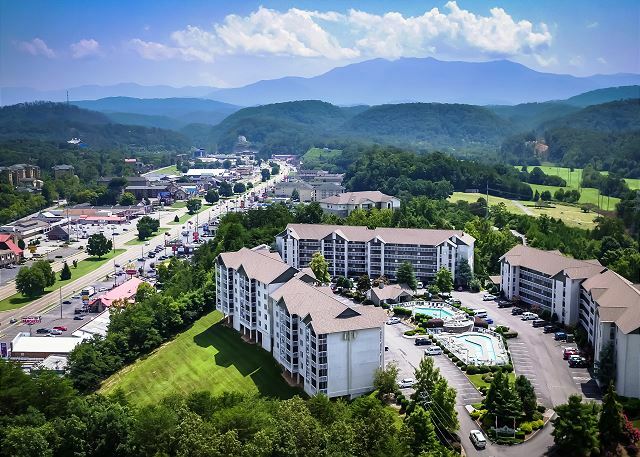 We hope that you'll stay with us again the next time you're visiting beautiful Pigeon Forge! Spent Christmas in the Smokies. Very impressed with Whispering Pines 441. Pros...warm pool, property well lighted at night, felt safe in parking lot-stairwells-elevator, parking lot security, GORGEOUS mountain view, large balcony w/comfy seating, fully stocked kitchen, cozy fireplace, close proximity to shows-restaurants-shopping, and incredibly quiet. Even though the property was full, it was so quiet on the balcony I felt that no one else was around! Cons...living room seating could be more comfortable. That's it. One con against several pros. Be sure to use the free tickets thru Explorie. It's very easy to book shows and the seats are great. Fourth row aisle seat for the Christmas Opry show. The property description and photos were very accurate. I definitely recommend this unit. Thank you for spending your family Christmas vacation with us at Whispering Pines condo 441! We greatly appreciate your feedback and kind words. The indoor pool is one of our guest favorites at this time of the year and the security is the best in Pigeon Forge. We are ecstatic that you had such a wonderful time and will be sure to look into the living room seating. We hope to see you again soon! This is our 2nd time staying at whispering pines. It was an amazing experience. The staff were so welcoming, the condo was clean and cozy, and the location was so peaceful and relaxing. We will be staying again next year! Thank you! Wonderful, we love to hear that you enjoyed your last experience so much that you decided to stay with us again. We certainly appreciate your kind comments regarding our staff and condo 441. We cannot wait to see you again for your visit next year! Great condo clean, comfortable and quite. Perfect review, excellent comments; thank you! It will be our pleasure for you to vacation with us again. Until then, stay safe, and we will see you next trip. We had a great long weekend getaway. The room was clean and comfortable. We will stay in this room again. Thank you so much for choosing Whispering Pines for your long October getaway. We appreciate your wonderful review and be sure to request 441 for your next visit. We were very happy with our unit, no complaints. Thank you so much for choosing Whispering Pines for your lodging needs while visiting the Pigeon Forge area! We're so pleased to hear how happy you were with your condo during your week here. We welcome you back to visit with us at any of our properties again soon! Condo was great and the staff was very helpful. We love hearing that you had a great stay with us at Whispering Pines. Your review and kind words are very appreciated. We welcome you back to stay with us again soon. Thank you so much for staying with us at Whispering Pines! We are absolutely thrilled to hear that you had an awesome time while visiting us here in beautiful Pigeon Forge in condo 441. We hope you'll stay with us again the next time you're in town! It was wonderful, wish we could've stayed longer. Thank you so much for staying with us at Whispering Pines! We greatly appreciate you and your wonderful comments about your recent weekend getaway. We hated to see you go but we welcome you back to stay with us again soon! The unit was very clean, had a great view, was on the quiet side of complex, had a very friendly office staff, close to all things in Pigeon Forge and Gatlinburg. We appreciate you spending your quiet getaway with us and that you found the condo to be convenient. We thank you for your compliments to the Front Desk Staff. Hope you will visit us again whenever you're in the area, we sure look forward to it. A very pleasant experience. Location was perfect. Quick access to the 321 Parkway. Condo was clean and the commedations were perfect. Employees were extremely polite and very professional. There was security personnel on the premises. We enjoyed the fireworks which could be seen from our balcony and/or at the swimming pool. A big thank you Whispering Pines. Everyone needs R&R from time to time to relax and recharge. We are glad that you found us and had a wonderful time in a perfect location. It is our pleasure to meet wonderful people as you and look forward to your return. Wonderful view in the heart of it all! Wonderful! We had a great few days in Pigeon Forge. The condo location was in the heart of everything. We also appreciated having security who monitored the premises during the evening. The condo was clean and very comfortable. And the view? Spectacular! Thank you so much for staying with us at Whispering Pines! We're so pleased to hear that you enjoyed the condo and loved the view. We want to ensure all of our have a great, safe vacation experience. We will take all measures to make sure that our guests are well taken care of while they are staying with us. We welcome you back to visit with us again soon! Nice clean condo. Great view. Quiet room. Very clean facility. Loved the lazy river. Thank you for staying with us at Whispering Pines! We're so pleased to hear that you loved the amenities, enjoyed the condo, and overall had a great vacation. We greatly appreciate your kind words about our property and welcome you back to stay with us again soon! Thank you for staying with us at Whispering Pines! We really appreciate your kind words about our condo. 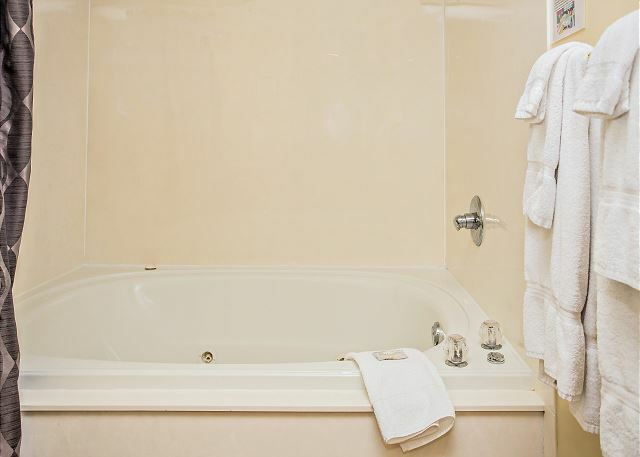 We're happy to hear you enjoyed you stay and got your relaxation in. We welcome you back to stay with us again soon whenever you're in need of another great getaway. Had a great experience.Excited to bring my granddaughter back for New Years.I've already booked my reservation. Thank you so much for sharing your birthday with us at Whispering Pines! We are so happy to hear that you enjoyed your stay so much that you've already booked to come back. That is such a compliment and we can't wait for your next visit. We hope your granddaughter enjoys it just as much, and we will all bring in the New Year together! Relaxing stay in pleasant condo with gorgeous balcony. So glad to hear you all enjoyed your stay with us at Whispering Pines! Condo 441 has an amazing view-perfect for relaxing on the balcony. Thanks so much for staying with us and please come back again soon! Whispering Pines has always been a great place for us to have a getaway. 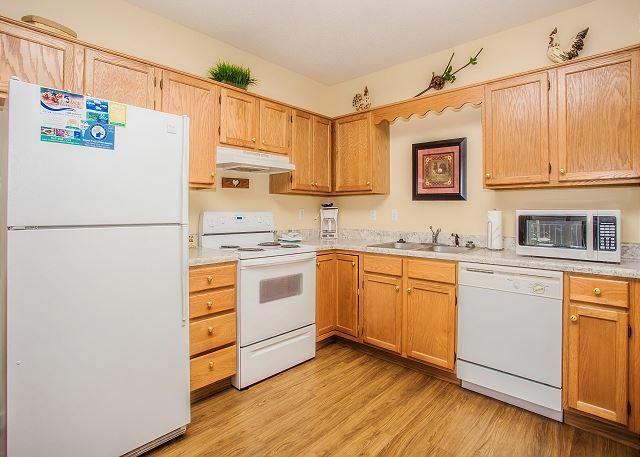 The condos are always clean and a great value. They are in a great location and convenient to all attractions. I would enthusiastically recommend Whispering pines to anyone looking for a special place to create special memories. Enjoy!!! Great! Thank you so much for all the kind words! We are very happy you all had a great time while you were here and Happy Anniversary! We look forward to seeing you again soon! This is our second stay (same condo). Staff is always friendly and helpful. The condo is clean and comfortable. Location is close to all sights/attractions. Wonderful view of mountains. Priced reasonably and they offer discounts to local attractions. Already planning for our anniversary in May. We will choose them again. Thank you so much for all the kind words! We appreciate you! Thank you for staying with us and we happy you all enjoyed your time with us, come back again anytime! I made a last minute online reservation enroute from Florida to Ohio. I liked being able to select the condo I wanted, as opposed to being assigned a hotel room somewhere else. I like that the location of Whispering Pines is off the main boulevard, and yet easily accessible and adjacent to the boulevard. Condo Unit 441 was immaculate, and had everything I needed for the two days I was there, or for two months. The owner of 441 & management are to be commended for maintaining the units, the buildings and facilities. Great! Thank you so much for spending time with us! We are happy you all enjoyed your stay and 441 is lovely! Come back and see us again soon! Great condo! Whispering Pines is so close but seems so far away from the Parkway hustle and bustle. Fabulous mountain view and condo was just like the pictures. The only concern is stepping into the deep whirlpool tub to shower and no handrails. Thank you so much for staying with us! We appreciate you and the kind words! We hope you will come back and stay with us again soon! Was very good, except one night and the next day didn’t have elevator, in bldg 4. We were on 4th floor. Otherwise good. Thank you! So sorry about the elevator having issues, definitely not the norm for us! We are happy you all enjoyed your stay otherwise! Come back and see us again soon! The condo was very clean and well equipped. The mountain view was spectacular. We enjoyed having our meals on the balcony. Although the resort was booked, it was quiet. The location was close to attractions. We had a wonderful time and are planning our next stay in January. Thanks for a great stay. Great! We are so happy to have you with us and that you all enjoyed your stay! It's a beautiful area and there is so much to do! Thank you for the kind words and we look forward to seeing you again soon! The wife and myself needed some quiet time away from the business of the daily work load. This we found and really enjoyed. Everyone needs a break from time to time; glad you and your wife could spent time with us in a peaceful, restful atmosphere in order to re-charge before going back to your daily work load. Thank you for your perfect review and comments. We await your next visit. Stay safe. From the moment we checked into the Whispering Pines Condominiums until the morning we checked out, we were treated with such friendly, helpful service. It is such a convenient property, close to all that we love to do in Pigeon Forge. The Old Mill area is one of our favorite places and it was only a block away. The choices of free show tickets were fantastic...we took advantage every day to do something different. We had trouble figuring out how the tv worked and one of the maintenance men even came to the condo and explained it to us. Though we didn't swim, the pools were lovely and the grounds well kept. Whispering Pines will be our #1 choice for future stays in Pigeon Forge. Thank you so much for your wonderful review of your recent stay with us at Whispering Pines. We could not be more pleased to know that you had a great experience with us. We appreciate your kind comments regarding our convenient location to many of your favorite places, our FREE amenities and our staff members. We are always here to help with any issue that may arise during your stay and resolve them promptly. Again, thank you for your amazing feedback, we welcome you back to stay with us again soon! We had a wonderful time in the condo! We loved having coffee and breakfast on the patio and enjoyed the mountain view! We look forward to coming back to this unit... so close to everything but yet so quiet!!! We greatly appreciate your perfect review and comments. 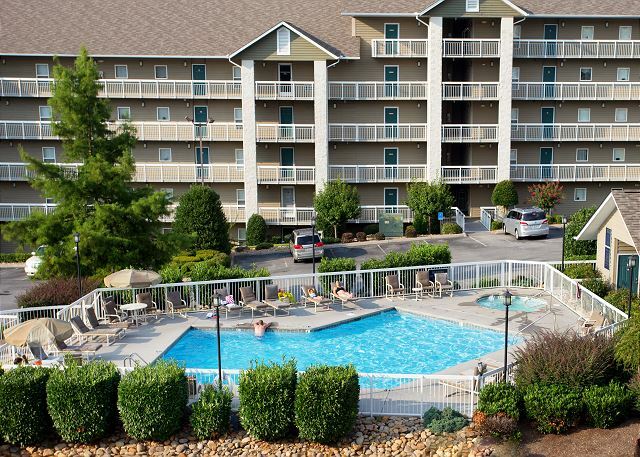 Our condos are conveniently located in Pigeon Forge, TN for our guests to enjoy all that the area has to offer. We are glad that you had a wonderful time and that you plan to return. The Whispering Pines is a wonderful place to stay! Room was very nice and we will be back!! We love staying at the whispering pines! Thank you so much for your wonderful review of your recent stay with us at Whispering Pines. We are glad that you enjoyed condo 441. We look forward to your next visit. After trying to get to the beach twice and had to cancel due to bad weather I decided to stay here. I stayed out on the porch a lot and enjoyed the mountain view and rocker. I got to see two different rainbows and I took pictures of them. This was a quiet place to stay. I hope to come back in the Fall. We are so glad that you had a fantastic stay with us and enjoyed the view of the mountains from the balcony while relaxing in the rocking chair. Enjoy your rainbow pictures; add more when you return in the Fall. VERY SATISFIED WITH THE ROOM.WOULD RECOMMEND TO OTHERS. Thank you so much for staying with us and we are thrilled to hear you enjoyed your time spent here! Property was clean and decorated nicely. Kids loved the pool. Great location. Thank you for telling us about your stay. Happy to hear you and your kids had a great vacation with us, please come back in the future! Wonderful. Close to every thing, but very quiet with a beautiful mountain view. We enjoyed the gym and the indoor pool as well. Perfect place to celebrate our 34th wedding anniversary. Happy Anniversary! Thank you so much for spending time with us, especially on such a memorable occasion! So happy to hear you enjoyed your stay and we hope you come back and stay with us again soon! Thank you for staying with us at Whispering Pines. We are so glad that you enjoyed your visit and condo 441. We appreciate your wonderful review and welcome you back to stay with us again soon. Our rental experience was great except for a small problem with our router. Thank you for choosing Whispering Pines for your recent stay in Pigeon Forge. We love hearing that you had a great rental experience with us. We are always here to help with any issue that arises during your stay. Thank you for your feedback and we welcome you back to stay with us again soon. This is an awesome condo very clean an a great view of the mountains the mattress is a little hard not real comfortable but we usually stay just a few nights but its still a great place to stay! Thank you for celebrating your special weekend with us a Whispering Pines. We are glad that you enjoyed condo 441 and the great view it offers. We hope to see you again soon! We were very satisfied with our stay. Room was very nice and clean with a great view. Great! Thank you for the kind words and we hope you will stay with us again next time you are in town! Enjoyed our stay here. The bedroom was a little crowded--the king size bed is just too big for the small bedroom. The kitchen could use a few more utensils and silverware. The view was nice and overall a good stay for us. Thank you so much for staying with us! Glad you enjoyed your time and hope you can come back and see us again soon! We will pass your thoughts on to the owner, thank you! The only problem we had any issues with was the condition of the mattress in the main bedroom. It is a bit worn and uncomfortable. Thank you for staying with us at Whispering Pines Resort. We will pass along your suggestion for a new mattress to the condo owner. We hope to see you again soon! We came down for a short weekend away and we loved it, we enjoyed it so much we already reserved a condo for a week next year. We are so pleased to hear that you loved your recent getaway to Whispering Pines. We appreciate your review and look forward to seeing you in 2018! Nice comfortable condo. Mountain view is beautiful. Very enjoyable. Paula Deens was wonderful. Apple Barn was delicious as always. Joe's Crab Shack was delicious. Rooms were fine except for the recliner. Thanks for staying! Hope you will find your way here next time you are in town, so many wonderful things to do and see in the area! We could not be happier to hear that you had an awesome stay with us. We appreciate you staying with us and look forward to seeing you again! Had a great time. Room was clean neat and we were close to all he activities we enjoy!! Thank you for choosing Whispering Pines for your recent stay in Pigeon Forge. We are so happy to hear that you had a great time during your trip. We appreciate you and your review. We look forward to seeing you again! times to family and friends. Great accomodations! Your review and comments are wonderful. Thank you! We look forward to your return visits to Whispering Pines Condos in Pigeon Forge, TN. Condo was very clean and nicely furnished. We will be back for sure! Great review and comments especially, "We will be back." Thank you for staying with us at Whispering Pines Condos in Pigeon Forge, TN. See you next trip. Wonderful experience! It been 8 years since I'd been to the Pigeon Forge area so I wasn't very familiar with all the lodging options. Whispering Pines did not disappoint! Unit 441 was very clean, well maintained and the view from the balcony was breathtaking. It was in a great location and I will definitely be booking another stay here! Wow! Thank you for your wonderful review of your stay in Whispering Pines condo 441. We know there are many lodging accommodations in the area and we are so excited that you picked us for return to the Pigeon Forge area. We look forward to your next visit! Our second stay at Whispering Pines! This was our second visit to Pigeon Forge, both times staying at Whispering Pines. Our first visit was in 2013 and we brought our children. This time, it was just my husband and I. We like the locale, feel the price is reasonable, the property is very clean, and the staff is helpful & welcoming. We will stay here on future visits to Pigeon Forge. I've recommended this property to others and will continue to do so. Also, lazy river and pools are great! We certainly do appreciate your taking time to give us your excellent review of Whispering Pines Condo, unit 441, in Pigeon Forge, TN. Thank you for your recommendations to others; we look forward to your return visits. It is a blessing to work here because we meet so many wonderful people. See you next time. The condo was as nice as the write up. Free tickets to three shows , one each night were a big savings and easy to purchase. Thank you for staying with us at Whispering Pines Resort. We are glad you enjoyed your Free ticket package that we provided at check in. We appreciate your wonderful review and hope that you are able to visit again soon. This cozy 1 bed, 1 bath condo had everything we needed for our 3 nite stay. A little tight on space in the bedroom because the king size bed pretty well fills up the room. The balcony affords a beautiful view of the Smokies. Unfortunately, cushions on chairs are torn and in need of replacing. The TV's were nice size for family movie night. Thank you for the kind words and we will address the cushions on the chairs as soon as possible...thank you for bringing it to our attention! Glad you enjoyed your stay and please come back soon! We love staying at Whispering Pines always very clean and great location. We never stay anywhere else. Thank you! We are so glad you enjoy staying with us and thanks for always coming back! Very nice place. Clean and comfortable at a good price. Great! Glad you enjoyed your stay! 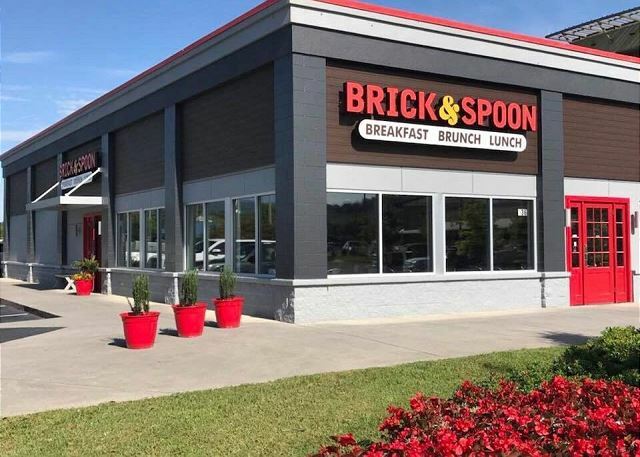 Hope you can make it back to Pigeon Forge again soon and hope you make our home your home away from home! I was pleasantly surprised by this condo and property. The whole unit was spotless! The bed was comfortable, as was the living room furniture. The tub was very spacious and the hot water works great! The room description doesn't do this condo justice. It definitely exceeded my expectations ten fold. I used the indoor pool which was perfect. I didn't have a chance to use the outdoor pool and lazy river but it looked great. I saw maintenance cleaning the outdoor pool area several times during my stay. I also loved the glider on the patio and the view of the mountains was great. I would definitely recommend this property to others and would stay here again myself. We are so happy to hear that you enjoyed your time spent at Whispering Pines and in condo 441. I know the owner of that condo will be thrilled to hear you enjoyed your time in their second home and were able to enjoy that nice view from the private balcony. They work hard to make their condo comfortable and just perfect for all those that vacation in Pigeon Forge. You will have to come back and try out the outdoor pool and lazy river sometime! It's really great on those humid summer days. Thank you for your kind words regarding our maintenance staff! They work hard so it's nice to hear that someone noticed all that they do. Again, thanks for staying with us and we hope you are able to return to Whispering Pines again soon! Love staying at Whispering Pines! We love having you! Thank you for visiting with us, hope to see you again soon. The condo was very comfortable and clean. It was in the perfect location and we really enjoyed our stay. Would definately stay here again. Thank you for your visit and excellent review. 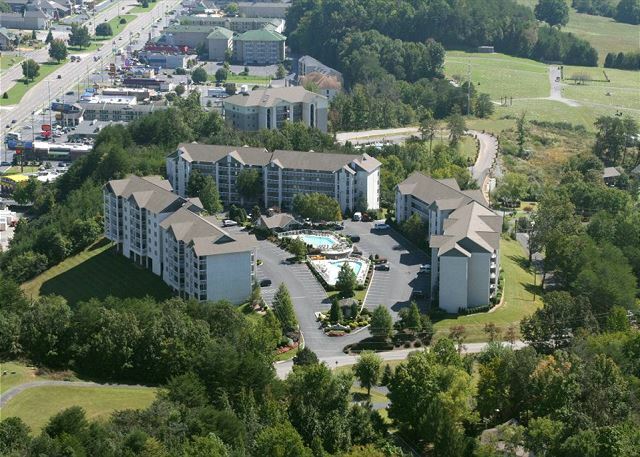 We are glad that you had a great stay and that you plan to return to Whispering Pines Condos in Pigeon Forge, TN. This was the best condo we have stayed in! Condo was very clean and comfy. Loved the scenery, indoor pool, Jacuzzi bath. We will definitely be back! Your comments are music to our ears. We could not be happier to hear that you enjoyed your stay with us. We appreciate you and look forward to seeing you again. We choose Wispering Pines because we have stayed before. It is a clean, comfortable condo that supplies all basic needs, and has an indoor pool and various extras that are appealing to guests. Glad to have you with us and we are happy you enjoyed your stay! Have a Happy New Year and come see us again soon! We had a great time staying at the whispering Pines The staff was wonderful and good to us and the room was clean everything was great the pool was nice thank you .. Thank you so much for staying with us and we are happy you enjoyed your stay! We take great pride in our properties and staff. Hope you have a Merry Christmas! This condo is very clean & convenient. The indoor pool was very nice way to while away the rainy days. Viewing the mountains from the balcony was beautiful. The bed was firm & very comfortable. The Lazy boy was comfortable, but the couch not so much. The kitchen was complete. Thank you for spending your 36th Wedding Anniversary with us. We are glad to know that you were able to enjoy the indoor pool while here. Our views at Whispering Pines are definitely a bonus, just beautiful. We will contact the condo owner in regards to the couch being uncomfortable. Thank you so much for your wonderful review and we hope that we see you for your 37th, if not sooner! This was our second stay at Whispering Pines. We love everything about these condos and the location can't be beat! Pigeon Forge is beautiful this time of year with all the Christmas lights. The condos are so clean and comfortable and prices are much better then a hotel room! We also love the free movie rentals and the tickets to area attractions. We love this place, too. It is a fantastic place to work because we get to meet wonderful people like YOU! We appreciate your excellent review and hope that you will make plans to visit us again at Whispering Pines Condos in Pigeon Forge, TN. We appreciate you coming and visiting with us. Happy to hear you enjoyed the one bedroom condo. Hope to see you again soon! Enjoyed the the stay. Very convenient to every thing. So glad you enjoyed your time with us! We hope to see you again very soon. We had a great time, condo was very nice. We appreciate your visit and your review. Glad you had a great time. We were happy with our location and condo; we plan to stay here again in the future. Thank you for staying with us! We are pleased to hear you enjoyed your stay in condo 441 at Whispering Pines! We look forward to your next visit. The property was very clean and the staff was very friendly. Location was great. I would recommend this place. Thank you for your feedback! We are pleased to hear you enjoyed your experience with us at Whispering Pines! We look forward to your next visit. The staff was very friendly and helpful. We enjoyed the lazy river and pool. Will definitely stay again. Thank you for your wonderful review. We appreciate you for choosing Whispering Pines for your stay in Pigeon Forge. We are happy to know that you enjoyed your stay and found the staff to be friendly and helpful. We hope to see you again in the near future. The condo was clean and well furnished , It had everything we needed to be comfortable. Thank you for choosing Whispering Pines for your stay in the Pigeon Forge area. We love to hear that you enjoyed your stay and found the condo to have everything you needed to enjoy your vacation. We hope to see you again soon. 30 year anniversary, and our first time visiting the mountains. This vacation was great and made many memories. Your staff was remarkable in all their actions. My only request would be, change out the noisy vent fan in the bathroom. Location is great, and the facility met all of our needs! Congratulations on your 30th anniversary! We are glad that you decided to spend the time with us at Whispering Pines Condos unit 441. We hope that you will come back and visit us again and make more memories. Maintenance has been notified to check the exhaust fan in the bathroom. 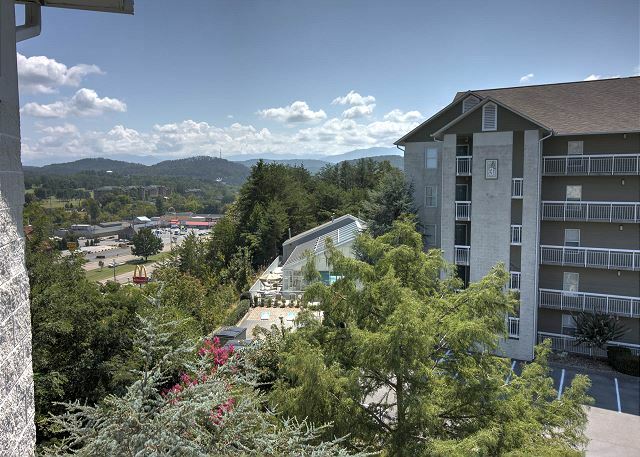 Our condos are conveniently located for all that Pigeon Forge, Gatlinburg, and Sevierville have to offer. We needed a few days off and away from the business of the day to day activities and we had the best of time with a great clean stay. Thank you for your wonderful review. We are pleased to hear that you were able to relax and have a great stay while at Whispering Pines. Please come back to visit us again when you need a quick or extended getaway from the everyday hustle and bustle of life. this was our first tripback to pigeon forge since the mid 90's. never rented a condo before but was very glad we did. great view, very clean and great amenities. staff was very friendly and helpful. hope to do it again soon. Hasn't Pigeon Forge, TN changed since the mid 90's? We are glad that you chose Whispering Pines Condos unit 441 as you vacation destination. Thank you for your great review. Was a very nice condo, well decorated nicely furnished and a good size for the two of us. View from balcony was awesome. Loved the indoor pool. Location was close to all we wanted to see. We are pleased to hear you enjoyed your stay in condo 441 at Whispering Pines! Thank you for staying with us, we look forward to your next visit. Another great vacation in the Pines! The staff at the Pines are friendly, and offer to make your stay as comfortable as possible. The condo is always clean, beautiful and the bed was comfortable. It is convenient to all entertainment and shops. You will love the indoor pool, and free movie rentals. We are so happy that you enjoyed your stay with us! We love our guests and definitely want each of you all to have a memorable time. Glad to hear you were able to take time and enjoy some of the on-site amenities as well. Thank you so much for staying and we look forward to seeing you in the future! We enjoyed our stay at the unit. The only thing I would suggest is that there was a very dirty spot on the carpet that should be cleaned. Other than that it was a very nice unit. We are happy to hear you enjoyed your stay with us Thomas! We appreciate our guests and your business. We do cleanings on our carpet often and I will have that spot checked out, thanks for making us aware of it. We hope to see you again on your next trip to Pigeon Forge! Renting 2 other condos worked really well for our annual thanksgiving in the smokies. This unit was very tasteful. The couch was not comfortable and the middle cushion was lower than the other 2 . Yet my girls worked it out to the best. Thank you so much for staying with us at Whispering Pines. We are pleased to hear that you and your family had an enjoyable Thanksgiving holiday. We will send your suggestions regarding the couch to the condo owner for review. We look forward to seeing you again soon. We had a wonderful time! We always love coming to Pigeon Forge and Gatlinburg. This iwas our first time at Whispering pines. . We will use Whispering Pines again. We are so happy to have had you stay with us at Whispering Pines. We hope this stay will be the start of many more visits and family memories made with us. Thank you for taking the time to post your review. We hope to see you again soon. Thank you! We appreciate your patronage! We have stayed at Whispering Pines for years mostly in @ BR condos. They are always, very clean, nice & staff is helpful & very friendly. We certainly want all of our guests greeted and treated like family while staying with us. It is great to hear you enjoyed your stay and we appreciate you being a repeat guest. Again, thanks for staying and we look forward to your next stay! Thank you for staying with us at Whispering Pines . We are happy to hear that you enjoyed your stay with us. We hope you can visit with us again soon. We were very pleased with our condo unit. Car show in town at the time of our stay...but we used alternate streets to access the parkway. Unit very clean & well maintained. Would stay here again. Thank you for staying with us during your recent trip to Pigeon Forge. We are happy to know that you found your condo very clean & well maintained. We hope to see you again when you are in the area. We have stayed at Whispering Pines for the last several years! We have stayed in several units. This unit was very nice and clean. Since I was with my parents this trip, I had to sleep on the sofa bed. Of course it was not comfortable at all, but I haven't slept on one that was like a real bed yet! We were there during the tornado warnings. Our building got hit by lightening and that knocked the elevator out the whole time we were there. It made it very hard on my parents. That, of course wasn't something that could be helped. We will be back, but next time I have them with me I will definitely ask for a first floor! We all have highly recommended W.P. to many other people! I wish there was some sort of program to reward us for the people we send your way!! I know for sure I have sent at least 5-6 families who have stayed there and love it!! Thank you so much for being a loyal repeat guest. We are happy to hear that you found your condo to nice and clean for your stay. We hate that the storm happened during your stay and that you were inconvenienced by the result. The elevator company said the storm really did a number on the elevator & was repaired as quickly as possibly. We always welcome specific unit requests and try very hard to accommodate guests that need a lower floor for easy access. We will also take in to consideration your suggestion for a reward program for referrals. We appreciate you as our guest and look forward to seeing you again soon. The rooms were very neat and clean. We had no issues whatsoever, and would recommend the rooms to friends. Happy to hear you enjoyed Unit 441! We had lots of fun swimming in the pools and especially the lazy river. We also enjoyed the free movie rentals. The location of Whispering Pines is very convenient to everything. However, the condo needs a little updating, ex. new carpet. Overall the unit was clean. Also the bedroom is small, while it does have a king size bed which is a definite plus, there is not much room to walk around in bedroom but the living room has plenty of space. We were traveling with a small child who needed room to crawl and there was plenty of room in the living room to do that. The staff at Whispering Pines is very nice. Thanks for staying with us Lisa! I will forward your review to that condo's owner. They love to get feedback from the guests. We sure do hope you choose to come and stay with us again and are glad you enjoyed the pool facilities! 441 was a very nice unit. We enjoyed the mountain theme decor. The furniture was fine except for the sofa. It looked fine but was not comfortable to sit on. Mattress needed replacing. We have had worse ones, but since you asked, Overall was very nice. Thank you for the review Juanita and for letting us know about the sofa mattress. We don't know unless guests tells us so we will be forwarding this information to the owner. We certainly hope you choose to visit us again!